Final episode of the session, starring Zhao Suria Lautan, our Eclipse-to-be naval officer (and the Night-to-be’s distant cousin). No dice rolls at all; the social rules stayed completely out of the way when we didn’t need them. Displaying the seal of the Ministry of the Heavenly Sword stamped upon his orders, Zhao Suria Lautan entered the magnificent Summer and Winter Palace. It perches on a low hill, so that one might look out from its minarets upon the city of Goldenseal, but where Lautan stood, he could see only the palace complex itself—its lush gardens, its walls thick with bas-reliefs, its wings and turrets and pagodas of polished stone and gold leaf. 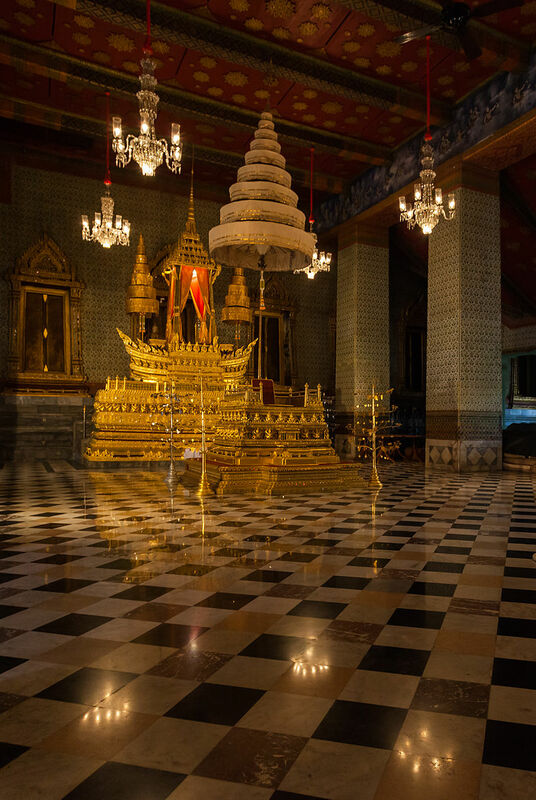 As a guard escorted him into one of the larger structures and through a maze of corridors and chambers, he passed a handful of officials resplendent in silken robes, their caps dripping with tassels and semiprecious stones. But they had little interest in the affairs of a lowly lieutenant in the Zhaojun fleet. The guard left him in an antechamber with a pair of other low-ranking naval officers. Zhaojun is large for a state in the Age of Sorrows, but the fleet is small and the Zhao noble families largely well acquainted with one another, so he recognized the two by sight: Zhao Biru Arindam, a bookish young man whose family owned a village near Lautan’s own, and Zhao Utama Giri, a small, agile fellow well-liked by his peers. After exchanging greetings, Lautan inquired as to whether the others knew why they had been called there, a fact their orders neglected. Giri opined that they were to receive an award for their service, while Arindam dourly proposed the possibility of some sort of punishment. This speculation was interrupted when a palace majordomo confiscated their armaments—indicating that they were to be taken into the presence of an important official indeed—and instructed them to follow. The official bowed them into a small audience chamber where two people awaited them. One was old Admiral Zhao Kuat Berani, currently a staff officer attached to the Ministry of the Heavenly Sword. The other, proudly enthroned on a dais with a diadem of white silk and lapis upon her brow? This was Crown Princess Zhao Mnemonrai Feiyen, a vice-minister of the Ministry of the Blue Robe, eldest daughter of the High Queen of Zhaojun, and heir-apparent to the throne. The three officers knelt before Crown Princess Feiyen—who had spoken no word, leaving all matters to the admiral—and swore the oath. The admiral looked from one young face to the next. “Have you any questions?” he asked. “What if you aren’t available to report to?” asked Lautan. “After this meeting, you will receive a list of contacts in the Ministries to whom you can safely report. Any further questions?” There were none. “You are dismissed,” the admiral said, saluting them in the Zhao manner. The majordomo led them back out to the anteroom, returned their dress weapons to them, and directed them to the palace gates. Here’s the third prelude of the second playtest session, covering the adventures of our soon-to-be Night Caste aristocrat-turned-smuggler. Things get a bit more interesting here, setting-wise. Rules-wise, we saw a few social influence rolls, though in at least one case we were able to gloss over the mechanics through mutual agreement, further demonstrating that the social rules can stay well out of the way when you don’t need them. It was the dead of night. Amid warm, thick mist shot through with the buzz of insects and the croak of frogs, Zhao Yujen Merak and his man Rik—who normally served as bosun on Merak’s pleasure boat, the Dancing Water—sculled a sampan heavy with smuggled goods down the steep northern shore of the Changdao estuary. “Hold,” said Merak. “I hear something.” The pair pulled the oars aboard and hunkered down to wait. Soon another fishing boat loomed in the mist. As it creaked alongside, they heard the slap of bare feet on the deck as a lunkish pair of peasant fishermen crossed over. “I think not,” Merak replied, rising from behind the cargo heap, knife in hand. The bosun loomed behind him, his powerful arms flexing as he hefted an oar. Nonplussed, the fishermen fled, and once the frantic plash of their oars faded, Merak and Rik continued on their own route. Then the harbor that was their destination emerged from the mist like a skull. The port once had another name, but for centuries had been known only as Gray Bone. Ancient pilings rose from the water like rotting teeth; sickly trees thrust up between paving stones like fleshless hands; lightless holes gaped in the facades of cracked and crumbling structures. Hungry ghosts crept across the old stone piers, their eyes black pits of hunger. Mooring their boat to a dock free of the hungry dead, Merak and Rik scurried ashore, their arms laden with boxes and bags. Merak led the way toward their rendezvous, only to spot an approaching pair of cloaked figures with fiery eyes. He dragged his man down a side street and through a maze of alleys, pushing through thickets and clambering over heaps of rubble—for he had been to this part of Gray Bone more than once—to come upon their destination from another direction. “And now for the rest of your payment,” she said, pulling him toward a yawning hole in the wall that might once have been an interior door. “I thought it was the rest of your payment,” he replied. She laughed. The two disappeared for a time, leaving the bosun and Nei’s man to watch for trouble while ignoring the sounds from within. Their business concluded, Merak and Nei said their farewells. With Rik at his side carrying the sack of silver, Merak got partway back to the docks, only to find the cloaked figures they’d evaded earlier were waiting for them. “Are you Merak,” one hissed, its tone more statement than question. The face—such as could be seen beneath its hood—was pale and unwholesome. “Zhao. Yujen. Merak,” croaked the other. They followed the speaker deeper into the ruins of Gray Bone, its companion silently falling in behind them. After turning down a broad avenue littered with trees, its flagstones torn apart by roots and sunk deep into tree trunks, they passed through a plaza that resembled a sickly forest. At the far edge, the greenery grew thin, then cut off abruptly. The streets beyond were gloomy and misty, lined by pale upright buildings and populated by ghostly figures. As they passed the line, Merak looked back and saw only blackness. “A shadowland,” he said, shivering. On to our second prelude of the session, this one covering a Twilight doctor from An-Teng. We actually referenced the 3e disease rules for this one, and they were pretty clear and straightforward. There were also a lot of bumbling minor NPCs running around, which looks like it’ll be a hallmark of this game. Harmonious Sanguine Blade took a moment to finish grinding up a dried scorpion in his mortar before rising to greet the dockworker who’d entered his clinic. His new client, a round-faced fellow named Bozhao Lucky Moon, explained that the Redwater District—a riverside area downstream from a dyeworks—was suffering from an outbreak of the bloody flux. He and his family had fled before the quarantine, and though they weren’t sick, he wanted medicine to ensure that they wouldn’t contract the illness themselves. Blade sent Lucky Moon off to bring his family. When they arrived, a quick diagnosis confirmed that they while they weren’t in the best of health, they hadn’t contracted dysentery. To calm their fears, the Twilight fed them herbal tea that he told them was medicine. Lucky Moon offered profuse thanks, adding that while he was happy that his family was safe, he feared for his neighbors and hoped that Blade would see to their health as well. The healer penned a quick note to his apprentice regarding his absence—in case another client arrived, or his noble patron required his services, or his father or sister came looking for him—then gathered the appropriate medicines in a bag and set off. At a barricade manned by constables in the azure leathers of the Ministry of the Blue Robe—Zhaojun’s security service—Blade proclaimed his intent to enter the quarantined area and tend to the sick. He readily agreed to a warning from the lieutenant in charge that he could not then leave until the quarantine had been lifted. He then entered the Redwater District, a once-prosperous area that had fallen on hard times after the Realm conquest. While some of the old fine townhouses remained well tended, others had been converted to tenements, while further apartments and hovels had been crammed in where gardens and pavilions once stood. Many buildings were boarded shut, their residents having fled the area; the streets were largely empty; moans of pain, mingled with the stench of illness, drifted from open windows. Blade found his way to a public laundry-house that was being used as a makeshift hospice, where dozens of groaning citizens received what little care their neighbors could provide. Presenting his bona fides to the old woman in charge, he spent several hours preparing and administering herbal remedies to those worst off, then moved on to the overcrowded tenements nearby. Sometime after midnight, Blade’s work was disturbed by a loud, repeated banging from an adjacent building. When it became clear that the noises wouldn’t cease, he headed next door, prying away boards so he could slip inside. Sneaking to the back of the well-kept house, he watched a group of gaudily dressed street thugs break a hole in the back wall large enough for them to enter through. The healer studied each of the thugs in turn—a largely spurious exercise, given the limited vectors by which dysentery might be transmitted, which he made far more uncomfortable than was strictly necessary—while the others roamed the house in search of loot. As they finished up, Blade gave them a clear bill of health. After a brief argument, the Hammer Gang members agreed that they’d stolen enough for one night—they could bring a few bits of furniture out to make sure they were fully laden—and that maybe it wasn’t worth hanging about and risking the flux or whatever unpleasant treatment was required to treat it. One thug remained unconvinced. “Snakefire Gang wouldn’t put up with this,” he grumbled, and not the first time. “Say ‘Snakefire’ one more time and I break your face and throw you in the river,” said one of his companions, hefting his hammer meaningfully. Harmonious Sanguine Blade waited a few minutes to ensure the thieves didn’t come back. He then returned to his patients, satisfied that he would suffer no further interruptions. Tomorrow he could determine the source of the outbreak. Tonight? He had work to do. Actual session writeups for my home game always run long, because I get all verbose when sharing my players’ exploits. So I’m dividing this up into multiple posts. I expected to do a bit of combat testing this session, but two PCs handled potentially violent encounters with social influence alone. It’s pretty effective! Hakim Abbas traveled westward along the road from Gem. He accompanied a caravan that had made its way through the Firepeaks and was now descending toward the lowlands. The caravaneers and a handful of fellow travelers left him alone, by and large. He was an imposing figure, this tall Southerner, with his leathers glinting with gold and gems, his panoply of weapons, and his animal companion, the lion Bahadur, whose hindquarters bore elaborate patterns of shaved fur. His traveling companions spent the trip in conversation, debating the relative merits of this or that city, ethnic group, cuisine, or religion, but Abbas paid little attention. His nape prickled as the caravan approached the fifth rockslide of the journey. Previous collapses had been natural, but this time he felt something was wrong. A score of archers appeared on the right-hand cliff overlooking the descending canyon path, validating the Southerner’s intuition. An arrow thudded into the woodwork of the caravan master’s wagon just inches from his head. Then a heavily armored woman—clearly the bandit leader—stood at the edge of the cliff and announced that the state of Hawkflower claimed a tariff for their passage. Several youngsters, ranging from ten to fifteen years of age, clambered down the rocks like monkeys, then began stuffing valuables into baskets on their backs. At first they shied away from the intimidating shape of Abbas and his equally intimidating lion. Then two girls approached and demanded that the Southerner throw down his valuables. With a few brief words, he assured them that any attempt to confiscate his wealth would go worse for them. The lion Bahadur spoke in a human voice to agree with his master’s assessment, a display the girls found equally convincing. One of the girls replied, in a low voice, that their leader would beat them if they did not bring back enough loot. She pulled back her sleeve to reveal bruises that might or might not have arisen from such an incident. Abbas proved equally unmoved by this entreaty. The bandit leader, irritated by her girls’ failure to perform such a simple task as relieving a traveler of his ornaments, advised Abbas that failure to comply might result in undesirable perforation of his epidermis. The Southerner, for his part, brought forth his flamepiece and offered to demonstrate its use. The bandit leader replied that the distance between them exceeded the weapon’s range, and indeed that she could withdraw before the flames could reach her, but her arguments were half-hearted at best. With a word from their commander, the bandit youths scrambled back up the cliff face with their take. The bandit leader acknowledged that she would permit Abbas to continue without the usual tariff, but she informed the caravan master that the Southerner was sufficiently unwelcome that any caravan that escorted him back along that route would face extermination. That evening, as the caravan made camp in a broad open space pocked with the scorch marks of a hundred campfires, Abbas was approached by Bai Gong Wen, a merchant of the seafaring Baihu people. The man had overheard Bahadur’s use of mortal speech, and he offered Abbas vast sums to purchase such a rarity. The Southerner made it quite clear that the lion was his friend and companion, not chattel to be bought and sold. After Bai Gong Wen turned in for the night, Abbas observed that others who wished to procure a talking lion might not take kindly to a declined offer or balk at gaining ownership through underhanded means. He advised Bahadur to speak in public only when absolutely necessary. A few days later, the caravan reached Footprint, a small trading city in the southwest of Zhaojun. After paying a sizable fee to enter the city, Abbas paid an urchin to lead him through the maze of bazaars, warehouses, mercantile compounds, and brothels to a reputable caravanserai. After procuring a room from the gregarious proprietor—“Two rooms or one? I’m not one to judge!”—Abbas headed out to gather information and inebriation at a local teahouse. By coincidence, Abbas encountered one of his many mercenary contacts, a veteran of the Tattered Prince Company named Yara of Longcliff. The two settled in to drink and reminisce. After asking if Abbas had any ongoing assignmnts, Yara said he was recruiting as part of a minor contract he’d obtained from the Zhao government. Extra guards were needed for the annual procession of the Golden Seal of Zhao, a relic that was carried each year from the capital city to the temple-city of Holy Fire and back. Would Abbas be interested? The Solar thought this a fine idea, and after sealing the deal with a handshake, they settled in for an evening of revelry. In the first Zhaojun playtest session, we followed Realm talonlord Coravan Calan during his reassignment to the Southwest. He was effectively in political exile for attempting to report corruption among his superiors, and had been shipped off to the edge of the world for his pains. Calan took ship to An-Teng, thence down the coast through the more lightly populated regions around the Silent Crescent, and on to the Baihu islands. At the mouth of the Meiyu Sea, his ship stopped for resupply at the Huang Hei naval depot. Seeking meaning in the congested bustle of troops around the docks, his inquiries among the soldiers revealed only that the Imperial legion garrisoned there had been sent south. At his new quarters in the garrison, Calan learned from a querulous Quill that Ren had gone missing—something which he had done often on the journey down, though on board ship it was of little consequence as the boy couldn’t go far. Now, though, Calan and Quill headed out into the plaza outside the garrison gates to track Ren down. They watched Ren as he talked to merchants and peered into shops, looking for someone or something. Night had fallen when a conversation with a peddler incited the boy to bolt down a side street. Quill, an older man, lacked the stamina to pursue, so Calan followed alone. After further queries of passers-by, Ren tracked his quarry to a narrow triangular courtyard. 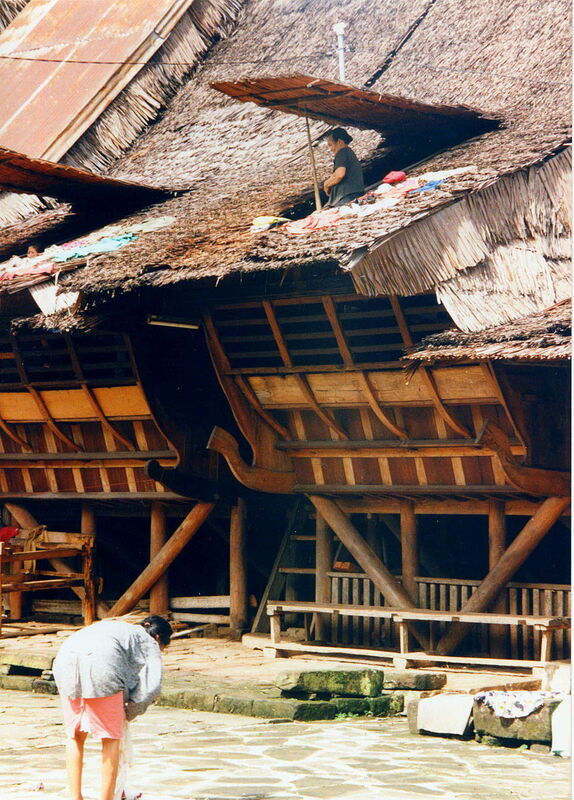 The young woman he met there, slurping noodles from a cart, was familiar to Calan. Indeed, it was a relative of his: Coradan Teva, his brother’s daughter, who had run away from home—and her arranged marriage to a boy she loathed—to follow the uncle she idolized. Calan spent several minutes firing angry words at the pair—at Teva for abdicating her responsibilities, and at Ren for enabling the girl’s behavior and failing to report it to his mentor. Only after the hairs began to prickle on the back of his neck did Calan realize that all around them, passers-by had withdrawn down alleyways and residents had closed their doors and windows. The noodle-seller slammed his shutters closed as a dozen thuggish fellows closed in on the three Realmfolk. The gang and its leader, Silver Shao, confronted the three with a jovial demeanor that provided a flimsy veil for insults and threats. When their japes veered toward the toothsomeness and potential price of the two youths, Calan threatened Shao with brutal, bloody death if he didn’t call off his men. We pulled the social influence system out of the box for this one, and Calan’s dead-eyed glare was very convincing. Only the gang leader’s Intimacy toward maintaining face in front of his gang allowed him to shrug it off. I had Calan Exalt halfway through the combat. Before Exalting, he was doing well against a small gang of crummy thugs and a boss whose combat skills were nearly a match for his own, but they successfully prevented him from getting away to help the kids, and it looked like he would eventually get ground down if he couldn’t scatter the battle group. However, once Calan started burning Essence on Charms, he swiftly gained the upper hand, carving a nasty gash across Silver Shao’s face and sending the gang packing. Once Calan was free to chase after his family, taking down the remaining thugs was trivial. Persuading Ren not to turn him in as Anathema was harder, but with some effort Calan convinced the boy to keep his secret and return quietly to the garrison… once Calan’s anima faded, at any rate. Seeing onlookers gathering at the far end of the alley, Calan pulled his cloak lower over his forehead and sought cover in an abandoned building until he could pass as a mortal. We should have used the social influence rules to determine whether Calan could convince Ren and Teva to come with him, but it was really late and we were dead tired, and frankly I was so zoned out at that point that I forgot that the social rules were an option—our group is used to handling social stuff through pure roleplay. We’ll give the social mechanics more of a workout next time! As a writer for Exalted Third Edition, I get to playtest the rules and setting before anybody else. I can’t share major system or setting details with readers; these things need to stay under wraps, either until the developers choose to spoil them or until the book is released. But I can talk a bit about my upcoming Exalted chronicle, which I’m running in 3e’s setting with the playtest rules. The game will begin in Zhaojun, a satrapy at the far southwestern fringe of Realm influence. A complex web of political relationships—involving characters ranging from satraps, princes, spirits, and Guild factors to merchants, bandit chieftains, philosophers and charlatans—should give social characters lots of fodder. Meanwhile, the more combat-oriented characters have any number of potential adversaries to deal with, whether it’s urban clashes with soldiers, assassins, and thugs, or hinterland adventures against pirates, beastmen, or whatever bizarre monsters lurk in the wild places of the Age of Sorrows. • Coravan Calan (Dawn): A career military officer from a patrician family in the northern Blessed Isle. Calan dutifully reported corruption among the officer corps to his superiors, only to find himself reassigned to the farthest edge of the empire for his pains. He has yet to Exalt. Calan’s player has an inclination toward highly moral characters. • Hakim Abbas (Zenith): Formerly the shaman of the Emerald Company, a well-respected Southern mercenary outfit headquartered in Gem, he has parted ways with them after his Exaltation. His only companion on the road to Zhaojun is Baladur, his talking lion. Abbas’s player is the most mechanically-minded in the group. • Harmonious Sanguine Blade (Twilight): Born to a Tengese mercantile family decimated by plague, he dedicated himself to the apothecary and chirurgical arts. After his Exaltation, he fell in with the Cult of the Illuminated, which encouraged him to further his medical studies in Zhaojun. Blade’s player is more interested in scheming than mechanics. • Zhou Yujen Merak (Night): Born into Zhaojun’s aristocracy, he lost everything when his elders were executed for treason and his family stripped of wealth and property. Now he’s a smuggler and a rebel, who aims to see Zhaojun’s royal house overthrown and the Realm ousted. Merak’s player enjoys complex, dramatic social situations. • Zhou Suria Lautan (Eclipse): A career officer in the Zhaojun navy, born of minor landed gentry. Though he deems himself loyal, his cousin Merak is whispering in his ear of how their people would be better off under a new regime. The two have commandeered a vessel to aid the incipient rebellion. This is my first game with Lautan’s player. We’ll have our first full session next week. 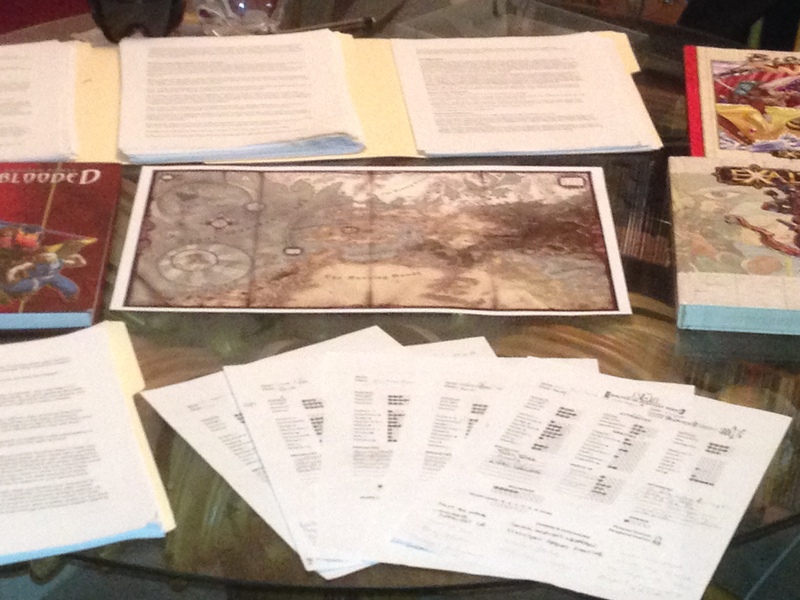 Until then, enjoy this photo of our game resources and playtest material!